It still smells like burning gunpowder. The deck is completely full of remains of combat after the boarding. We could be enjoying our looting in Isla Tortuga but our Captain insisted on coming to this goddamned island instead. In the meantime, our gunner ‘Mad’ Harry does not stop telling us stories and legends about some fantastic creatures that dwell in this place. The Doctor seems uneasy, grabbing the hilt of his sword, sweating a lot more than usual after listening to Harry’s tales. -Old Sanders lost his leg after having cut it himself. He escaped alive from the jaws of that shark-headed abomination in human form …- Harry was explaining at the same time he was miming with all his body doing so, acting out the scene with his eyes moving all directions as if they were about to jump off his face, in a way of magnifying the facts. -I would not like to lose my leg…or my arm, or any other limb from my body. I appreciate every single limb and organ of mine- was murmuring the Doctor who was more and more nervous. –Do you think there will be more monstrosities like those? Yo ho ho! 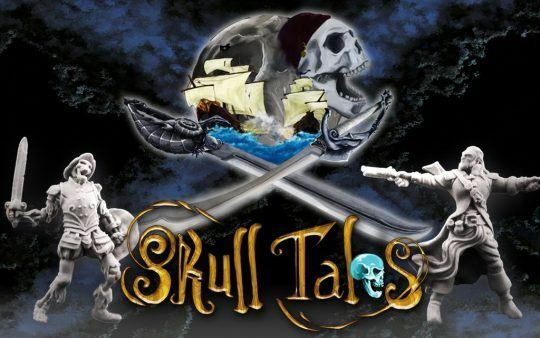 Skull Tales is an adventure game in which each player performs the role of a pirate character in order to fulfill any pirates’ dream: to become the ship’s Master and to reach the most precious booty.